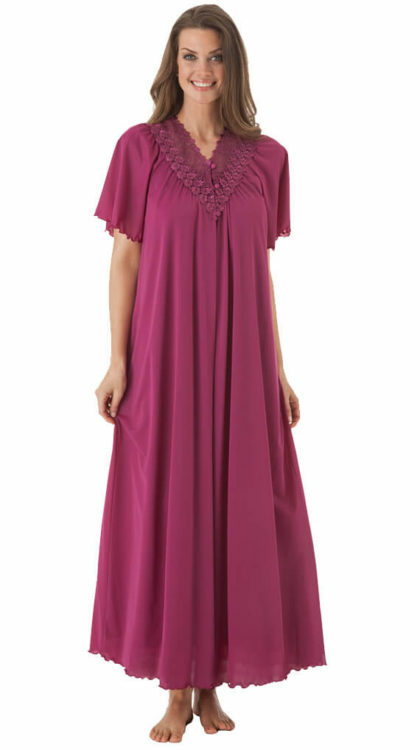 Slip into something a little more comfortable with this long and flowy woman’s nightgown. Hand braided spaghetti straps and a Venise lace appliqué neckline bring this elegant nightgown to life. Shadowline’s® Opacitrique® nylon is soft and enjoyable, making it a bedtime must-have! Interested in a peignoir set? Complete the look with our Beloved button-down robe. I have several of this gown, both short and long. The long is my favorite. I have lost weight and now need to get smaller gowns. I have blue because that was all that was available. Would love a turquoise one. Noting that all the comments request more colors, would you consider doing so? I love the feel and fit. Works no matter what the season. Will be ordering new smaller ones soon. Love this gown, the more you wash the better it feels….Please bring back the magenta color….. Still love the style! They NEVER wear out!!! Unfortunately, I have notice that the fabric is thinner than it used to be…I just wish they had more colors! Please bring red and purple to this style and bring back the deep teal! I have been a fan of Shadowline night gowns for years. My favorite is the Lace Spaghetti Strap long night gown. It is so soft and silky and moves with me when I sleep. It does not bind or restrict me at all. The gown launders beautifully and always looks brand new. I have the pink and blue and am so pleased to find the black available in my size. I wish that you had more colors available in this style. I would buy them all. It is a family Christmas tradition that I give my daughter a nightgown on Christmas Eve. She only wants the Shadowline Lace Spaghetti Strap long nightgown. Please keep making this style, we are customers for life. I LOVE these gowns and currently have two and ready to add a third one. The quality of Shadowline nightgowns surpasses every other brand. Glad to see they are doing well as a company after re-orgong a few years ago. I have all the colors except black which I am ordering today. I really love this nightgown. So full and comfortable and they make you feel beautiful. Please come out with some more colors. Perhaps a green or even red. I have worn this style gown for YEARS! So comfy and elegant! They never wear out! So glad to get it in the pink!